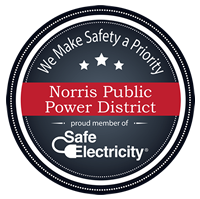 Norris Public Power District’s electric system is a subtransmission and distribution system consisting of 676 miles of 34.5 kV and 69 kV transmission lines, 5,502 miles of primary distribution lines, 75 distribution substations and 15 industrial substations. About 660 miles of the total 6,178 miles of distribution and transmission lines are underground facilities. The District receives the majority of its power and energy from Nebraska Public Power District at 14 delivery points. The 34.5 kV and 69 kV transmission system is arranged to interconnect between the major delivery points and provide for reliability of power supply and flexibility of system operation. Norris Public Power District serves a total of 48 communities at retail service and five communities at wholesale service. Although almost half (48%) of the District’s electric energy sales are from large and industrial customers, the District’s electric system is primarily a rural distribution system. Operating revenues were $86.6 million in 2018. The District serves approximately 24,400 customers in six counties. Day to day operations of the District are managed by Bruce Vitosh, General Manager/CEO. Norris employs 89 staff members.